Twelve years ago today I initiated fire mimicry treatments on a grove of diseased coast live oaks in Marin County, CA. Since then Leith Carstarphen has been doing the followup work on these trees. 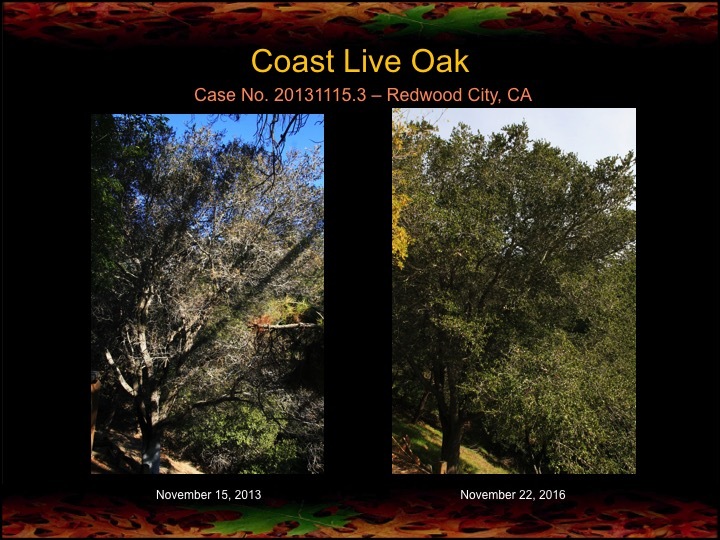 Several of these oaks have stem canker infections, probably Sudden Oak Death disease. Two of the oaks in this grove have since died from stem canker infections, but the remainder of the oaks are clearly flourishing. I should note that, for the above oak, the yellow appearance of the foliage in the recent (right) photo is due to dense clusters of yellowish male flowers. These thriving oaks stand as testimony to the long-term efficacy of indigenous-based tending techniques (e.g., fire mimicry) in restoring the health of oak forests. Eleven years ago I began treating this grove of oaks in Hillsborough, CA using indigenous-based methods (ie. fire mimicry). These sets of photos show their response after 11 years of care. 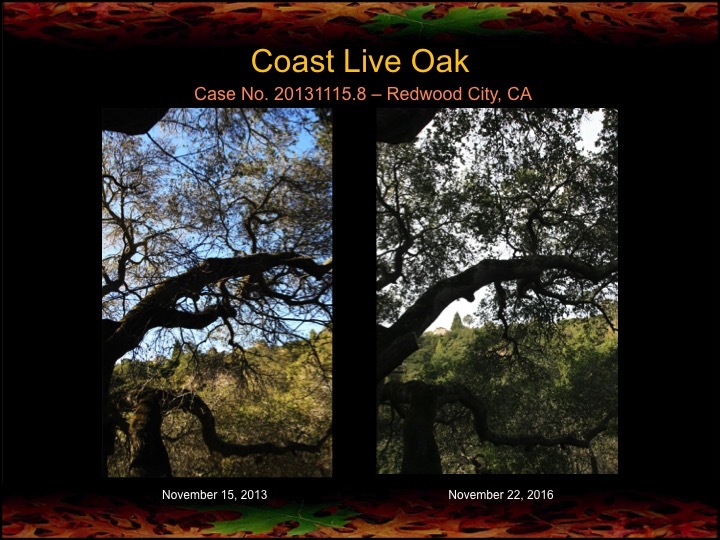 These are very significant results in that they show that these methods result in long-term (decade+) sustained recovery of oaks that were in decline. Oak lovers and tree huggers, please take notice! And, please, thank the native ancestors for showing us the way! This last oak has been pruned since the initial photo. Note also that the roofline has been altered by construction, obscuring part of the tree. This oak has been infected with a stem canker disease (probably Sudden Oak Death) for the entire period. Despite the disease infection, which has been reduced via fertilization and surgery, this tree remains in relatively good health. Here in California there’s been, rightfully, much attention paid to a recent report on the death of more than 100 million trees in the state. Sadly, there has been no talk of solutions, even in the face of clear evidence that prescribed fire and other indigenous-based tending practices (e.g. fire mimicry) improve forest health. Today I offer, yet again, further evidence of our ability to address the death and decline of oak trees. 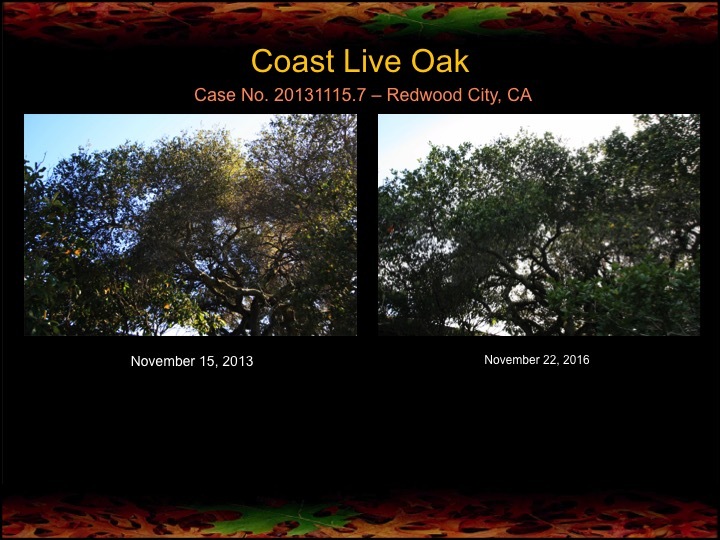 The coast live oaks shown here are located in Redwood City, CA and were all treated with fire mimicry 3 years ago. Yesterday I revisited these oaks, some of them heritage oaks, and took photos to assess the changes in their canopies over that time. In my view, the decline of the oaks here has not only been abated, it has been reversed, as most of the oaks are showing a clear improvement in the fullness of their canopies. How many more observations and studies of successful forest restoration efforts are required before more people start acting to save our trees? Two years ago I had the task of helping a grove of struggling heritage oaks in Redwood City. All of the mature oaks are centuries old and reveal signs of having been tended by native people. I’m happy to say that after two years of applying fire mimicry methods based on traditional ecological knowledge these oaks are making a strong recovery.